The third installment of Our Scribe's look at the 10th season of the World Championship, 1959. While ordinarily the Grand Prix Circus would have happily departed the rather bleak scenery of Aintree for more cheerful environs, this was not the case in 1959. As the teams departed for the Continent, it was not for Adenau and the Nurburgring that they headed, but to a place further east. For reasons having entirely to do with the politics of the Cold War than any merits of the proposed circuit, the German Automobile Club decided to hold the 1959 edition of the German Grand Prix in Berlin. Or, as it was emphasized, West Berlin. The venue was the Automobil Verehrsund und Ubangs Strasse, or the AVUS, which roughly translates as "Automobile Traffic and Practice Street." An unusual name for a racing circuit, to say the least. The track was conceived in 1907, although exactly who hatched the idea is unclear. Not until 1913 did construction actually begin on the AVUS. This was due to the problems raising the necessary finances needed to build the circuit. The outbreak of the First World War brought a halt to the work on the AVUS. However, at one point prisoners from the Eastern Front were used to work on the track. The end of the War brought an end to any work on the circuit. The track lay derelict until 1921 when a certain Hugo Stinnes managed to raise the necessary capital to resume work on the track and complete it. THe track was simplicity itself. It was composed of two parallel 8-meter wide tracks separated by a grass median strip of similar width. The track ran from the Kaiserdamm, in the Charlottenburg district, to the Bahnhof at Nikolasse. At the north end of the track was a wide-radius loop, the Nordkurve, similar in layout to a traffic circle. It was also slightly banked so as to allow the cars to keep the speed up through the loop. At the other end was the Sudkurve, a hairpin corner. Each track ran 9.78 km and the total lap distance was 19.57 km. After a series of minor races, in 1926 the AVUS was host to the First German Grand Prix. It was Rudolf Caracciola's first of six victories in the German event, the other five being at the Nurburgring. In the winter of 1936, the need for access road to the Berlin Motor Show meant that the Nordkurve and the new access road would be almost literally "cheek by jowl," and much too close to allow any use by racing cars on the Nordkurve. The Berlin Motor Show agreed to pay for a replacement for the Nordkurve. Instead of merely replicating the old traffic loop type of turn just further south on the track, an entirely new type of Nordkurve was built. A massive banked turn was erected instead of merely replicating the old Nordkurve. It's banking was 12 meters wide on the racing line and banked at a 43o angle at it steepest point. However, it was laid out as an actual turn and cars did not flow through the turn as one would expect on a banked turn. This also meant that the cars tended to drift to the upper part of the corner, which was nearly vertical. The new Nordkurve was a real handful. At the same time, the Sudkurve was almost modified. It was configured to be much like the original Nordkurve, a high-speed traffic loop. The track length was reduced to 19.29 km, with an additional 500 meters added since the races now started on a separate grid off to the west of the Nordkurve. The already high speeds leaped even higher. The AVUSrennen of 1937 is one of those legendary races, the streamlined Auto Unions and Mercedes-Benz ducking it out on the track. And it was a spectacular success financially as well. However, it was not repeated again in great part due to the death of Auto Union driver Bernd Rosemeyer. The AVUSrennen was revived in 1951 through 1953 for Formula Two cars. 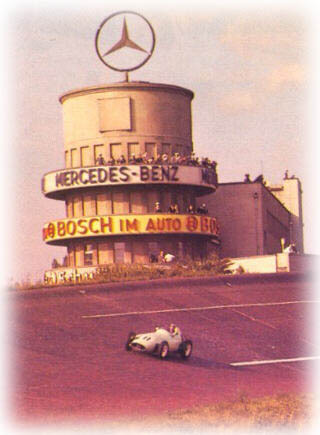 The last major race at the AVUS was the Berlin Grand Prix in 1954, which was a Mercedes demo run won by Kael Kling. The track was shortened to 8.299 km due to alterations dictated by the southern portion of the circuit now being in East Berlin. The Nordkurve remained, however, and the Sudkurve was back to being a hairpin as in the original, only much closer the Nordkurve. Due to concerns over high speeds and tire wear, the race was scheduled to be run in two 30 lap heats. As a precaution, Dunlop buffed its R5 tires down to 3 mm of thread. As it was to turn out, the tire wear was never a problem. The winner finished with the race with the almost 2 mm of thread and did not change tires at the interval between the heats. The first day of practice was spent sorting out the cars to suit the Nordkurve. For the non-Ferraris, it was almost used to plot and scheme how to stay in the draft of the Ferraris. Although a track capable of supporting a large number of cars, the organizers restricted to grid to 15 starters, with there being two reserves. Scuderia Ferrari had a Dino for Cliff Allison and Scuderia Centro Sud a Cooper-Maserati for Ina Burgess. The reserves, should they start, were only eligible for prize money, not any starting money. In those days the latter far exceeded the former. Since this was the German Grand Prix, it was deemed that German cars and drivers were necessary. Therefore, Wolfgang "Taffy" von Trips in a works F2 Porsche and Jean Behra in his Porsche-engined Behra were given spots on the grid, and Hans Herrmann given a ride in the BRM P25 entered by the British Racing Partnership (BRP). By the time the dust settled and practice was over, Tony Books in a Ferrari Dino, as expected, was on the pole. The others on the front row were Stirling Moss (Rob Walker Cooper-Climax), Dan Gurney (Ferrari), and Jack Brabham (works Cooper-Climax). The fastest lap in practice, however, was set by a reserve entry, Cliff Allison. Fastest lap or not, as a reserve it was all for nought since the grid was for 15 starters only, no exceptions. The times set by the two Porsche entries were hopelessly off the pace, being 10 second off the slowest of the the Formula One cars, the Lotus 16-Climax of Innes Ireland. On the day prior to the race, as part of the racing weekend, the organizers staged a race for 1500 cc sports cars. With fenders - as well as bills to pay, the Behra-Porsche was entered and expected to do well. The field was primarily Porsches, naturally. As the cars left the starting grid it began to rain. On the second lap of the race, the Porsche of Fritz d'Orey spun while on the Nordkurve and crashed into the front of the barriers at the starting grid. The next lap saw Carel de Beaufort disappear over the top of the Nordkurve in his Porsche. Few expected to see anything but wreckage from the incident. Somehow, de Beaufort managed to not drop onto the concrete paddock behind the Nordkurve, but instead motoring through the brush on the reverse slope of the banking, missing the support pillars through some extraordinary good fortune. Suffering on a crumpled nose, de Beaufort re-entered the race only to be black flagged by the disbelieving Clerk of the Course. The very next lap after de Beaufort vanished over the top of the banking, Jean Behra also spun in the Nordkurve. Unfortunately, Behra's luck finally ran out. The car slid up the banking, hit a concrete block which launched it skyward over the top of the banking. The car, with its driver caught half-in and half-out of the cockpit, hit one of the very substantial flagpoles that lined the top of the banking. Death was instantaneous. The race ran out its appointed laps with Joakin Bonnier winning in a Porsche, leading von Trips across the line. As a result of Behra's death and Porsche withdrawing the von Trips entry, the two reserve entries, Allison and Burgess, were now in the race, but forced to start at the rear of the pack. In light of the accident the previous day, at the drivers' meeting, it was announced that in the case of rain the Nordkurve was to be a non-passing zone, and no cars allowed above the yellow line about two up the banking. At the start, Tony Brooks powered off the line and into the distance. He was being chased by Moss, Brabham, and Brabham's teammate, Masten Gregory. After only one lap Moss' gearbox broke and he was out. On lap three, to everyone's amazement, Masten Gregory nipped past Brooks for the lead. Brooks recaptured the lead on lap 5, but it was a gutsy display of driving by Gregory. The other Ferraris of Dan Gurney, Phil Hill, and Cliff Allison were now moving to the head of the pack to support Brooks. Gurney and Gregory had a real ding-dong of a battle until the Cooper's engine decided that it had had enough and blew up. This allowed Brooks to back off and Gurney to close up at the end. The heat ended with Phil Hill in third and works Cooper Bruce McLaren in fourth, one lap down. The carnage in the first heat was high, among them Brabham when the Cooper's clutch having failed. Allison's similar failure after four laps was the only blot in the Scuderia's copybook. The second heat gathered the three Scuderia Ferrari cars and the walking wounded for another start. Although they managed to find nine cars to line up on the grid, six were already a lap or more back. The pounding of the Nordkurve and the strain of braking for the Sudkurve was having its effect on the cars. The second heat was a demonstration run for the Scuderia. From the drop of the flag at the start to the drop of the flag at the finish, they were never challenged. Only one car managed to stay on the same lap with the red cars, the other Rob Walker Cooper driven by Maurice Trintignant. He managed not only fourth in the heat, but fourth overall. During the second heat, Hans Herrmann provided the subject for one of the most spectacular racing photographs ever taken. As he approached the Sudkurve at about 300 kmph, he discovered that he had no brakes. After vainly trying to scrub off speed by downshifting, the BRM hit the hay bales and executed a series of flips that totalled the car. Fortunately, Herrmann was thrown from the car on the first flip and suffered only minor injuries, mostly bruises. With Brooks scoring the win and the point for fastest lap, Brabham and Moss coming up empty pointwise, suddenly the points picture saw Brooks four points back from Brabham, 27 points to 23 points. Phil Hill was now third with 13 points and followed by Bonnier with 10 points. One good thing did emerge from the Berlin race. A close examination of the Moss gearbox revealed that the gears were not machined properly and as a result were failing after relatively minor use. The Colatti gearboxes were all returned to the factory for extensive rebuilds that would, hopefully, resolve the problems. From the doom and gloom of first Aintree and then Berlin, the Circus next set up shop outside Lisbon at the Monsanto circuit. The 5.44 km circuit used a section of the Lisbon-Estoril autostrade and the road network through a large park. It was a scenic, exciting circuit, being easily dubbed a "driver's circuit," code for saying that unless Moss broke, the battle was for second. The only problem was the organizers lined virtually the entire course with hay bales, something that did not please the drivers. The Usual Suspects appeared along with the return of Aston Martin and local color being provided by Mario Cabral in a Scuderia Centro Sud Cooper-Maserati. Practice was two short sessions and and Moss took the pole from Brabham by a margin of two seconds, with Gregory filling out the front row. Due to the daytime heat, the start was not until 5 o'clock PM. And even then the heat was considerable, especially since there was little shade in the paddock area. At the start, Moss was gone and that was that as far as the race for the lead is concerned. Moss put on a magnificent display of driving skill and literally just left the others in his dust. On the sixth lap, the Hills - Graham and Phil - managed to run into each other and both ended up retiring, although neither suffered any injuries. After a difficult time in practice, Brooks had a race that was just as bad. Cursed with a car that was immune to anything done to improve it, Brooks only qualified tenth and finished ninth in the race. While in a comfortable second place (far) behind Moss, Brabham was lapping Cabral when the Portuguese driver moved over on him and forced Brabham off the racing line into a hay bale and then into a telephone pole. The wreck tossed Brabham out of the car and onto the track surface, just off the racing line. Although dazed and not badly hurt, it was only the greatest of luck that saw Masten Gregory manage to avoid him as he lay on the track. The marshals gave the on-coming car that anything was amiss, much less a driver lying on the track. The front tire of the Cooper literally came within centimeters of Brabham's head. Without any assistance from the marshals, Brabham managed to stumble off the track under his own power. One interesting part of the race was the Joakim Bonnier / Bernard Cahier refreshment stand that opened for business at the far hairpin on the circuit. After retiring from the race after BRM expired, Bonnier teamed up with journalist Cahier to provide a watering station and refreshment stand for weary drivers battling the late afternoon heat. 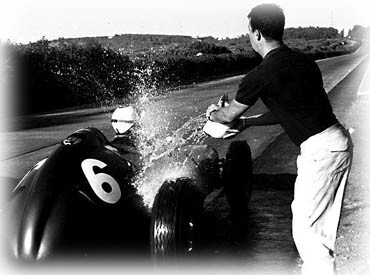 Drivers were handed water or citrus drinks to quench their thirst and also treated to a shower with Bonnier's helmet being the bucket. Try to even imagine something like that today! With the win and fastest lap, Brooks and Brabham leaving without any additional points, suddenly Moss was in the points picture once again with a shot at the Championship. Brabham led with 27 points, followed by Brooks with 23 points and now Moss with 17.5 points. Phil Hill retained fourth in the Championship despite his shunt with Graham Hill.